Here is a fourth sample chapter from the yet-to-be-published London in Diaries, this one about Thomas Cobden-Sanderson, a bookbinder associated with the late 19th century Arts and Craft movement. His diary, more than any other, reveals a passionate relationship with London’s most important (historically and geographically) feature: the River Thames. No feature of London - not even St Paul’s or the White Tower - has as much physical presence or historical importance as the river Thames. Indeed, it has been around much longer than the city itself, and has been the most significant factor in the city’s growth over the years. Many of the diarists in this collection mention the river, but none have as vital or as spiritual a connection as Thomas Cobden-Sanderson, and none write of it as romantically, as here: ‘What I should like to convey is the intense energy, sparkling, crisping, into moments of whitest, brightest light, again and again and again, everywhere over the surface of the the outstretched sheet of water.’ He was an extraordinary man in many ways, abandoning a legal career, he took up with William Morris’s Arts and Craft movement, becoming a highly-skilled bookbinder and printer. Apart from lyrical descriptions of the river, it figures often in his exquisitely-written diary for more practical reasons, whether because he is walking with his lover along the Embankment, setting up a business in a house with a garden that runs down to the riverbank, or secretly at night drowning blocks of valuable metal type. Thomas James Sanderson was born in 1840, at Alnwick in Northumberland. His father, James, was a district surveyor of taxes who worked his way up to become a Special Commissioner of Income Tax at Somerset House. After grammar school, Thomas studied at Trinity College, Cambridge, aiming to enter the church, but he left without taking a degree, apparently in protest against the examination system. After a period of soul searching, he was called to the Bar as a member of the Inner Temple, where he worked throughout the 1870s. He was involved in establishing the powers, rights and obligations of the London and North Western Railway Company, a task which debilitated his health, and led him to go abroad to recuperate. In Siena, in 1861, he met Janey Morris (wife of William who, still in his 20s, was in the process of launching a new-style company to supply decorative arts). Janey was with two daughters of Richard Cobden, a well-known British manufacturer and statesmen. The following year Thomas married the younger Cobden daughter Anne (she was 29 at the time, and he 41), and, out of respect for her father, changed his own surname to Cobden-Sanderson. Soon after, he left the Bar and, eager to work with his hands in the spirit of the evolving Arts and Crafts movement, took up a suggestion by Janey Morris, to train as a bookbinder. He and Anne lived first in Hendon and then in Hampstead; and they had two children, Richard and Stella. Cobden-Sanderson took his new craft to the highest level, binding classic works of literature in simple but sumptuous floral designs with gold on leather. Unusually, he chose which books to bind, and sold them through Bains in the Haymarket. By the late 1880s, his bound books were much in demand from American buyers. Both Thomas and Anne were early socialists. Anne became a leading campaigner for woman’s suffrage, and was arrested in 1909 for picketing outside 10 Downing Street (and kept a diary while in prison). She also did much to press for various improvements in children’s well-being. In the early 1890s, Cobden-Sanderson started the Doves Bindery at 15 Upper Mall, Hammersmith, a small house with a garden running down to the Thames, not far from William Morris’s Kelmscott House. At first, he employed several professional binders to work on individual books as he had done, but, in 1890, he launched, in partnership with Emery Walker, the Doves Press, and thereafter the Bindery worked more mundanely to cover printed editions. Between 1900 and 1917, the Doves Press produced 50 classic titles (Shakespeare, Milton, Goethe, the Bible, etc), all in the so-called Doves Type (designed by Walker) and all austere, characterised by a lack of illustration and ornament, in reverence to the literature itself. Although the partnership with Walker, who had other interests, had been dissolved in 1908, it allowed Cobden-Sanderson to continue using the Doves Type until his death, at which time it would revert to Walker. Fearing his ex-partner might not use the type in a way he thought fitting, Cobden-Sanderson chose to destroy it. He did this during many nights in the latter half of 1916 by throwing the metal blocks into the Thames. Subsequently, he wrote to Walker’s lawyers, and his actions became public knowledge. Cobden-Sanderson died in 1922, and Anne was left to settle, at some personal cost, the legal action brought against her husband by Walker. Throughout most of his life Cobden-Sanderson kept a regular diary. 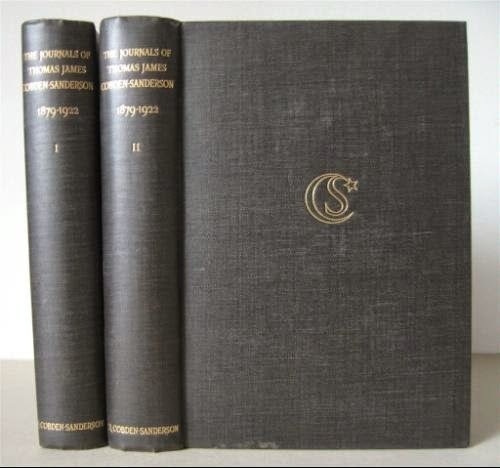 This was edited by his son, Richard, and published in 1926 in two volumes as The Journals of Thomas James Cobden-Sanderson, 1879-1922. 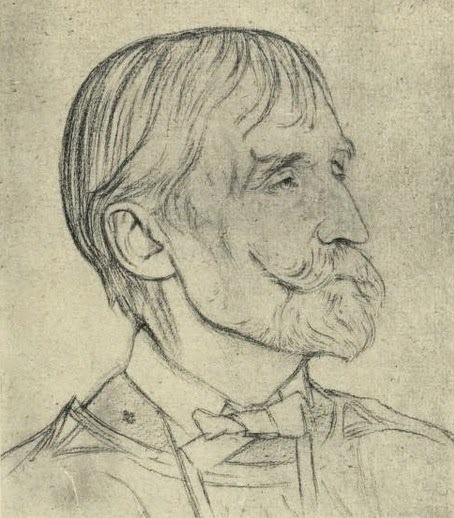 They reveal the author as a spiritual man, high-minded and intellectual, lacking perhaps a little in humour and colour himself, though the details that emerge of his life and those of others in the Arts and Crafts movement are immensely interesting, not least those about the early life-changing suggestion by Janey Morris and those about the disposal of the Doves Type. And through all of his life, apparently, and the diary, runs the River Thames which regularly inspires him to flights of literary fancy. Here there came a knock at the door, and my diary fell to the ground as I rushed to open it. It was Annie back from Chelsea. We embraced, and then she hurriedly began to tell me of a girl whom she had met on the steamer, red-haired, consumptive, Scotch, an envelope folder or sorter, returning from the Brompton Hospital where she was an out-patient. (She ought to be an in-patient, but could get no letter). [. . .] She got 1d. for 1,000 envelopes, and, when well, made 12s a week. Why don’t you learn bookbinding? Yesterday afternoon we called at the Morrises, and in the evening supped with the William Richmonds, where we again saw the Morrises. I was talking to Mrs Morris after supper, and saying how anxious I was to use my hands - “Then why don’t you learn bookbinding?” she said. “That would add an Art to our little community, and we would work together. I should like,” she continued, “to do some little embroideries for books, and I would do so for you.” Shall bookbinding, then, be my trade? I am now the proprietor of a workshop! On Saturday I signed an agreement by virtue of which I became on Tuesday last the tenant under Mr Williams (of Williams and Norgate [a bookseller]), of three rooms of the second floor of 30 Maiden Lane, being part of the back premises of Williams and Norgate’s shop in Henrietta Street at £50 per annum. On Monday, Morris and the Hyndmans came to lunch with us, and I afterwards went with them to Hyde Park to take the opportunity of the Liberal demonstration to spread socialistic literature and to hold an open-air meeting. This last was a fiasco, being brought to an ignominious close by an ugly rush of the crowd. On Saturday Annie and I went to the meeting for the protection of young girls, in Hyde Park. Mrs Morris was in the procession of the Ladies’ National Society, and Morris in the brake of the Socialist League. I went on to St James’s to see the Graham pictures on view at Christie’s. Burne-Jones, Rossetti, Millais and F. Walker - prodigious performances. They, and the works of Millais and Holman Hunt on view in Bond Street, constitute a body of art which quite startles by its greatness. Yesterday I went into town to do some shopping. I called at Bain’s [booksellers]. He told me with great joy that he had only one of my books left - The Gospels! Last Sunday I visited Morris’s printing press. Morris was a little down; not up to talking. The Press has been set up in a little cottage opposite The Doves, and next door to Sussex House [Upper Mall, north bank of the Thames in Hammersmith], and is worked by two compositors and one pressman - of course all by hand. I saw the new type, and the sheets, paper and vellum, already printed The Glittering Plain. I am reading Pater’s study of Dionysus. It is delightfully silent. From the window I see the lights on and beyond Hammersmith Bridge, and the lengthened reflection on the dark river, and I hear the occasional sound of an oar turning in the rowlocks; but the tide is low, and the otherwise-sounding river is still, sounding only with the passing toiling barge, and alive with moving lights. On my table are my tools, and a glass of tiger-lilies given to me out of our garden by my cleaner, Mrs Mansel. Morris is dead. He died on Saturday 3rd October at 11:30 in the morning. I saw him alive in Riverscourt Road the preceding Monday. I had been to the Bindery to get some of my books for the Arts and Crafts Exhibition, and I was on my way to the Gallery on my bicycle, when on turning the corner into Riverscourt Road I saw before me, going in the same direction, Morris in a bathchair, with a shawl across his shoulders [. . .]. I had never seen Morris in his chair before. It was a strange sensation to see the strong man so reduced. Yet he looked clear of complexion and ruddy red, and though he said not a word he yet lifted his gloved hand and waved me farewell as I mounted again and turned and bade him good-bye. . . a last good-bye. How superbly beautiful the river is at this moment! There is a high wind blowing the surface into innumerable ripples, each of which catches instantly and reflects a dazzling gleam from the sun, so that there are as it were countless diamonds at play, reflecting and deflecting rays of brightest light, so that the river’s face is an ever shifting . . .
What I should like to convey is the intense energy, sparkling, crisping, into moments of whitest, brightest light, again and again and again, everywhere over the surface of the outstretched sheet of water. Education: shall we at last transform it, and with it our vision of and dealings with the world? Shall we have the energy of the light I see in dazzling brilliance playing upon the reflecting facets of the water, and play with the earth our home, and its dwelling-place, the infinite voids of space? Education will be transformed. “Arts and crafts” will invade and overcome literature and science and commerce, and with our own eyes we shall re-see the universe, and with our own hands and brains we shall re-create it afresh. My writing splutters and fails of the mark. A cold mist this morning shuts out the sun, and only the near trees, now so yellow, are visible, and the outlines of the bridge. [. . .] On Sunday I went to Hampstead, and lunched with the Kapteyns, and had tea with Blomfield, and looked over the wall at the old house and home, No. 49. It looked very pretty, but Hampstead is becoming every moment more hideous with affluent vulgarity. I wheeled along the Finchley Road to the cemetery, and went and stood by the dear, quiet grave of Father and Mother. The sea-gulls - or river-gulls? - are sweeping in wide curves to and fro over the river - the river slides smoothly on its course - the wintered trees, arrested, placidly wait for the spring, the sky overhead is one continuous veil of stationary cloud. I have just seen Swinburne pass through the [British] library into the Large Room preceded by a lady and Watts-Dunton. Swinburne had on a grey, large, soft felt hat. His head, too, seemed vast, his shoulders, on the other hand, seemed slight and very sloping, and his figure plump but small. He walked without moving his body, or arms, which were held down straight at his sides. So passed our greatest living poet. I rose from my seat to see him, and pondered upon the insignificance and significance of things. The library remained as undisturbed as the surface of a lake and its whole body of water by the entrance of an undistinguishable pebble. The poets are the supreme craftsmen - the poets at their best. But all life at its best is poetry. Having resolved to close the Bindery next year, it seems to follow as a matter of course that I should close the Press also. But whereas I seemed to come naturally, after twenty-five years, to the former resolve, to come to the latter seemed to be against nature, there are so many great books to print and so few to bind. Yesterday was a lost day, save that in the morning I was at Westminster Cathedral and St Paul’s - the former, by the way, was the finer. St Paul’s seemed littered up with columns and architectural ornament, and the arches under the dome hideous in the meanness of their junctions coming down together, and [William Blake] Richmond’s decoration has not enlarged them. The effect of the Cathedral, on the other hand, with sun and shade and enclosed atmosphere, was quite beautiful. In both, however, the singing was enchanting. I came [to Kew Gardens] to see the great lily. But one had flowered and passed away in a day, and the next would not flower till to-morrow. I walked around the tank and saw the blossom of the flower to be, and its vast leaves outspread upon the water, slowly born and quickly dead, and so on from age to age. I was at Kew on Saturday, and walked through the flower-house; lilies, lilac, azaleas, camellias, carnations, all, and others in sweet flower; and around them, outside, the bare dreaming trees, whose time is yet to come. On Sunday afternoon, yesterday, Mrs Pankhurst called. She was gentle and affectionate, but, as it seemed to us all, tired. The prison immurement seemed to have damped her fire. [. . .] This is an odious result of prison, and an argument against its use as a weapon of revolt. Annie must not go again. Last night I went to the Albert Hall to hear Larkin [Jim Larkin, an Irish trade unionist then heavily involved in the famous Dublin Lock-out dispute], and was disappointed. When he was speaking a raid was made on the hall by some “students” from outside. Suddenly a sound of running feet arose in the corridor, then the attention of the whole audience was concentrated on a dense commotion at one of the entrances to the hall and the passage leading down from it, and from all parts of the hall men rose from their seats and rushed towards it. The scrimmage continued with a dead sound of the struggle, but, as I remember, otherwise in silence. But from above women leant over from the balconies, and looking upon the struggle applauded. As it went on - I witnessed it from a box - limelights burst out in various parts of the hall, and finally the organ contributed its roar to the ear, playing “The Red Flag.” At last victory was cheered by the audience, and Larkin resumed his speech. The students had been driven out; but outside they raided the electric works, and tried to put out the lights of the hall, fortunately unsuccessfully. I was disappointed; not in this, which was highly dramatic and thrilling, but in Larkin’s speech. Last night Annie and I went to see and hear Anatole France [French novelist and man of letters] at the Suffolk Street Galleries, at the invitation of the Fabian Society. Bernard Shaw in the chair. Anatole France looked like an affectionate old fox, and spoke with great animation, and many smiles and many wrinkles. He was, or seemed to be, short and stout and bent and grey. Justice, Pity, Mercy, Love - these are things as wonderful as are the flowers of the field and the stars of heaven. Clear for London, and cold. Yesterday morning as I walked through Kensington I paused in front of a “provision” shop, and looked at the birds - shot, and hanging with their heads downward - golden plovers, pheasants, partridges. Pitiful sight. Europe and the world are now in the hands of statesmen and warriors, who have enslaved - and are now hurling against each other their enslaved - human beings, drilled to destruction. Death, not Life, and Death in another form than in times of peace, now fills to their utmost limits the minds of men, and spreads itself over all the aspects of life. A few moments ago, as I passed into [Hyde] Park, a regiment of recruits marched by - it brought tears to my eyes. In the Green Park, newly erected, there is an enclosure and platform, and on the latter, with its muzzle appearing above the screen, is mounted a gun. In the midst of Peaceful Green Park. This morning I walked to Kensington through the Park. At Hyde Park Corner three guns mounted on trucks passed. Horrible looking weapons, apparently for high firing. Walking on, I saw a company of soldiers doing bayonet practice, piercing sacks with a thrust of their bayonets. I had just passed the gardens on the other side, where the flowers of spring were just piercing the grass. How beautiful they were; how horrible the bayonets. The Doves Press type was designed after that of Jensen; this evening I began its destruction. I threw three pages into the Thames from Hammersmith Bridge. I had gone for a stroll on the Mall, when it occurred to me that it was a suitable night and time; so I went indoors, and taking first one page and then two, succeeded in destroying three. I will now go on till I have destroyed the whole of it. Just returned from Bow Street whither I went at 2pm to stand by Bertie Russell, on trial for some writing which I had not seen in some obscure pacifist journal. He was sentenced to six months’ imprisonment in the second class. He appealed, and Frank and I bailed him out, otherwise he would have gone straight to prison. To prison, to solitary confinement, day and night in a locked cell. There was not a crowded court, only a gathering of friends, mainly women. [. . .] Bertie sat in front of the dock with his co-defendant, a young lady editor and proprietor of the journal in question, The Tribunal. The bells are ringing, and the guns have ceased. All London went merrily mad yesterday. I was indoors all day. All London merrily mad; all Germany? The race was rowed yesterday, and after a terrific struggle - first Cambridge leading, then, at Hammersmith Bridge, Oxford, then beyond Chiswick, out of sight, Cambridge - Cambridge finally won by a length, but never once, or hardly once, was daylight seen between the boats. The crowd was immense, for the day was fine, and it was expected that the race would be a great race. We had a great crowd, and all the morning was taken up in preparing tea - cakes, tables, etc. - and arranging seats and benches in the garden. We were to be “at home” from 4 to 6pm - the race being at 5 or thereabouts - and by 4 I was exhausted, and retired to the parlour to rest. The Diary Review is now over 10 years old. One of my main objectives for the website has been, and remains, to celebrate the incredible wealth of freely available diary texts online - to provide links to this material. However, many of the links in older articles have become outdated, and for this reason I am endeavouring to re-examine each article on or around it’s tenth anniversary. Occasionally, I am re-publishing these articles in the present with a new intro and date (in which case the article carries a note to this effect). Mostly, however, I am simply replacing outdated links where I can. If I can’t find an original source any longer, I am removing the links. Thus, some of these older articles are now less hyperlinked than they once were. They remain, though, as an archive of where the information was originally found. And so made significant . . . The world’s greatest online anthology of diary extracts, presented by calendar day, in the same way as popular books such as The Assassin’s Cloak and The Faber Book of Diaries. However, this anthology includes many more, and many longer, extracts than is possible in a published book. It also provides a wealth of links for further information about the diaries and diarists. ‘. . . this amateur (in the best sense) attempt to document historical and literary diarists is a great browse. Truly a labour of love by one individual, over  diarists can be accessed through a variety of lists, including alphabetically, chronologically and by profession, and for each there is a brief biographical summary, journal dates and a few links. This isn’t the site for in depth information on any of the diarists but it does provide a good overview of journal-writers from 838 right up to the present day.’ Michelle Pauli, The Guardian. The Diary Review (along with its companion websites And so made significant . . . and The Diary Junction) are maintained privately without any funding or advertising. If, however, you like, or make use of, either website please consider supporting their author/editor by purchasing one or more of his books in the Not a Brave New World trilogy. Thank you. Not a Brave New World is a fictional memoir, a trilogy in three wives, spanning the whole of the 21st century: one man’s - Kip Fenn’s - frank account, sometimes acutely painful and sometimes surprisingly joyful, of his three partners, and his career in international diplomacy working to tackle the rich-poor divide. Kip Fenn’s first love is in a coma. His father suddenly isn’t his father. After formative trips to Brussels and Brazil, Kip wins a civil service job. Unfortunately, a media baron discovers his sexual weakness and is blackmailing him for government secrets. If only Kip could find solace in his wife’s arms or joy in his children. Kip Fenn is a success: his career has taken off within a major UN agency trying to spread wealth from the rich to the poor. But all is not well with the world - the golden age of oil and chips is now over, and unsustainable development is leading to social turmoil, and to world war. Kip has found love and a new family, but he can find no way to stop his older children self-destruct; nor does he realise his partner’s deceit. Third time lucky - Kip Fenn finds true love. His UN career though is ending with a whimper. Another terrible war is cut short by the devastating Grey Years, and while nations rebuild many individuals turn Notek. In restless retirement, Kip’s lifelong passion for vintage photos sees him launching a new arts institution. But who is the mysterious visitor by his bedside, and how will she affect his planned deathday?